On September 19, 2018, Nanakuli High and Intermediate School (NHIS) and the Waianae Coast Comprehensive Health Center (WCCHC) dedicated their new School-Based Health Center (SBHC). The SBHC was created to address chronic absenteeism, which is one of the most powerful predictors of student success. NHIS is the third school to partner with WCCHC to open a SBHC. In 2016, SBHCs were established at Waianae Intermediate School and Waianae High School. All three SBHCs were established after convening a community schools group consisting of school leadership, families, staff and local organizations, who identified student health as one of the primary factors underlying chronic absenteeism. Parents suggested the creation of a health clinic on campus as one way to address the issue. "Chronic Absenteeism can impact a student's ability to stay focused and graduate on-time, which affects their college and career potential well into the future," said Dr. Christina Kishimoto, Hawaii Department of Education Superintendent. 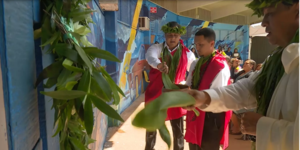 "Nanakuli High's new Health Center will help to diagnose health issues on-site and reduce absences, keeping students on-track towards academic success. We thank our partners at the Waianae Coast Comprehensive Health Center and the Kaiser Foundation for their continued support." The SBHCs offer students a full range of pediatric clinical services including diagnosis and treatment of illness and injuries, sports physicals, management of chronic diseases such as asthma and diabetes and referrals for behavioral health services such as anxiety and depression. Behavioral health referrals have been offered since January 2017 and will also be available at the new NHIS SBHC. From January 1, 2017 to May 31, 2018, SBHC clinic providers made referrals for behavioral health services to 1,195 students. A federal grant provided initial funding for the SBHCc with an additional $86,000 in grants from Kaiser Permanente. 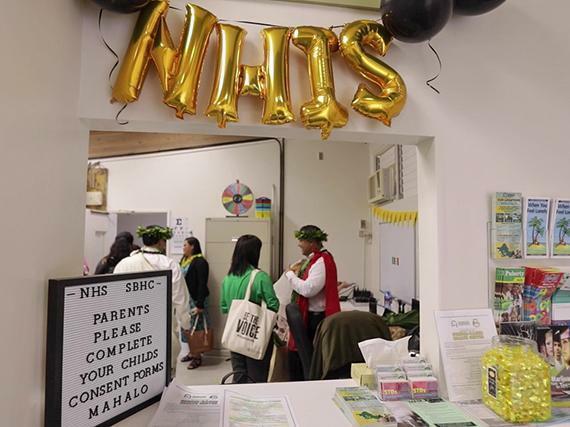 "Supporting behavioral health care is essential for the total health and well-being of our keiki," said Dave Underriner, President of Kaiser Foundation Health Plan and Hospitals, Hawaii Region. "Waianae Coast Comprehensive Health Center will have a tremendous impact on Nanakuli Intermediate and High School students. We're proud to partner with them to provide health services that will empower students to succeed." From August 1, 2016 - May 31, 2018, a total of 3,724 students received primary care services at the WHS and WIS locations for everything from cough and abrasions to headaches and ankle injuries. Of these students, 3,512 (94%) were able to return to class immediately after treatment. Many teens have not had a comprehensive physical exam or even been seen by a primary care provider in years," said Dr. Vija Sehgal, Chief Quality Office and Director of Pediatric Services at WCCHC. "Thanks to our partnership with the schools and support from the Kaiser Permanente, these clinics located conveniently on their campus will help change that while also empowering teens to play an active role in their personal health and well-being." For a student to receive care at the SBHCs, their parent or legal guardian must complete and sign a Parent Consent Form. The consent forms and other information including hours and locations can be found at www.wcchc.com/SBHC. 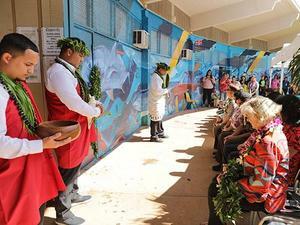 Immediately prior to the clinic blessing, a beautiful mural was blessed that co vers the interior walls of the large interior courtyard of Building A (where the SBHC is located). Local artists Cory Taum and Kahiau Beamer worked closely with NHIS students to design the mauka to makai theme. 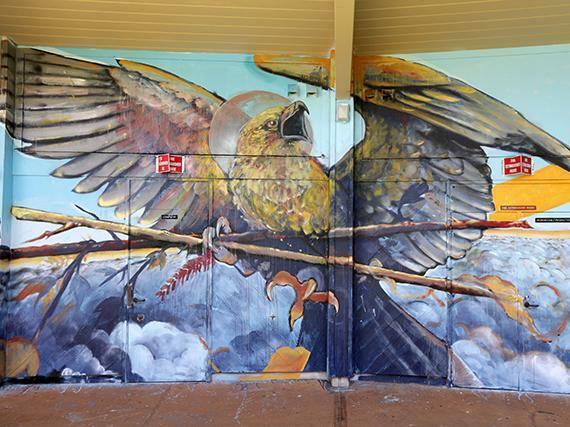 The golden hawk (NHIS mascot) is prominently featured along with other plants and animals found in the Nanakuli ahupuaa.